The singer dropped a two-minute behind the scenes look at the video starring Paul McCartney on Facebook. Just a week after releasing her new song 'FourFiveSeconds' featuring Kanye West and Sir Paul McCartney, Rihanna has unveiled a behind the scenes look at the forthcoming music video. 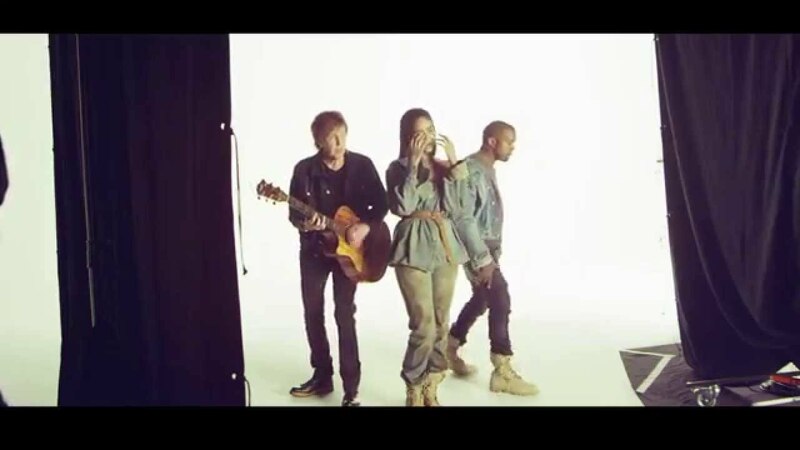 The video shows Rihanna, Kanye and Sir Paul on set and was shot at the same time as the artwork for the single. The clip sees Rihanna reveal that it was Kanye who inspired her new all-denim look. "Kanye came up with the idea of doing just some real street denim, all American type look," Rihanna says, before admitting that she's wearing one of the rapper's jackets in the video. At present it's not clear when the 'FourFiveSeconds' video will be released, but the song is available to download now.